How To Railway Ticket Cancel | How To Ticket Cancel Charge? 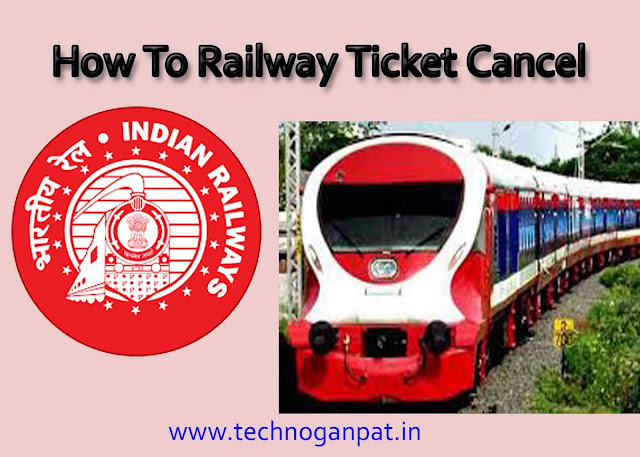 Railway Ticket Cancel How To Ticket Cancel Charge? India is the largest country in the area of ​​population. India has around 250 crore population, of which around 121 million population travels daily in trains, out of which 10 to 12 million people have to cancel their travel after taking a train ticket and from those 10 to 12 million people There are about 2-3 crore people who do not even cancel their train ticket despite the cancellation of the journey because they do not know about it that we can also get the tickets canceled. In today's post, I am going to tell you all how to get the ticket canceled. Canceling the Railway Ticket is not a difficult task. If you have a Counter Ticket that means that you have taken the ticket from Station, then it will have to go to Station Counter and cancel it. But if you have Ticket Online (E-ticket) then in such case you have to cancel it online. You can complete this information and get full details about it. Normally Train ticket is of 2 types. First of all, I am going to tell you about the cancellation of unreserved tickets because most people travel in this train from this ticket. First of all, let me tell you that unreserved tickets are valid for 12 o'clock in the night. The meaning of this is that by mistake, if your train is gone, then you can travel on any train going to that route on that day. But if you have to cancel your journey for any reason and you want to cancel the ticket, then you will have to return to the railway station and go to this ticket counter which ticket ticket you purchased the ticket. There you will have to say ticket master to the ticket cencil. Ticket Master will withdraw your ticket and give you the value of that ticket. How to increase traffic to your new blog ? Unreserved tickets can be charged 10 rupees. Whom the ticket master gives you in handheld ticket price is reduced. Now if reserved ticket is reserved, reserved tickets are canceled in 2 ways. First of all, we learn about canceling the ticket manully. To cancel the reserved ticket, you will have to come to the railway station and go to the reserved Ticket counter. Both the reserved Ticket counter and the unreserved Ticket counter are different. After going to the counter you have to ask for the ticket cancel. Then ticket master will give you a form to fill. You will have to write all the details related to your journey like that on the train number, date of travel, time of train, all this in the form. After filling the form you have to give it to the farm ticket master. ticket master will give you money by canceling your ticket. What is a Central Processing Unit (CPU) CPU? - New! A charge of 60 rupees to 80 rupees is charged for cancellation of reserved tickets. ticket master will give you the money by cutting the cancelling charge from the ticket price. It is a matter of talking manully to cancel but if now let's talk about how to cancel the online ticket then it is completely different from manual ticket cancel. Only the same ticket can be canceled online, which we have made online ticket book by ourselves. Step.1 online, we will have to login the account of our IRCTC account from which we had the ticket online book. Online cenciling also costs 60 rupees to 80 rupees. Within 24 hours of canceling the online ticket, your money will be deposited in your bank account. If for some reason you do not get your money back you can ask by calling the IRCTC's helpline number. You will find the helpline number by searching on Google. So in this way you can cancel your train ticket.